It’s a phrase we hear pretty often in terms of sacrifice — things in life have costs attached to them, whether explicit or implicit. When we make decisions, we have to count what we’ll be giving up and what we’ll gain to decide if the cost is worth it. Whether it’s evident or not, “Nine Bucks” is all about our characters in flashbacks and present-day counting the cost in their decisions and relationships. So let’s discuss what they’re willing to sacrifice in order to gain something of value. 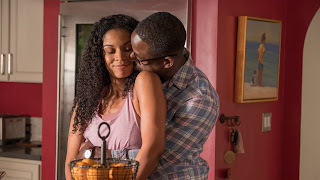 I love Randall, but in “Nine Bucks” we finally get to see how Deja feels about being essentially told that she is “the same” as Randall just because he was also adopted. After the fallout of Deja’s destructive behavior in the season two finale, we learn she’s been in counseling. Her mother officially signed away Deja’s rights, and that clearly affects the young woman. On Randall’s birthday, he vows to try and talk to Deja about being adopted into the Pearson family. 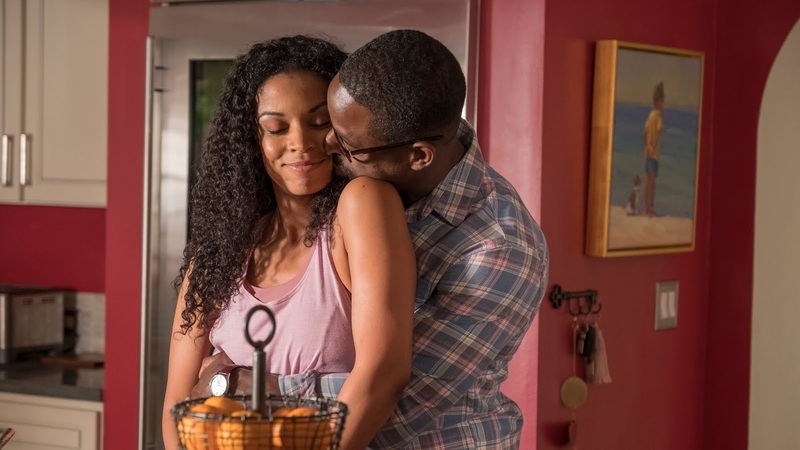 While Deja is appreciative of all that Randall and Beth do for her, she still doesn’t think Randall gets it: they’re not the same. And she makes a very valid point, honestly — he had two dads who loved him, and a mom who did too. He might have gone through difficulties as a child, but they paled in comparison to hers — and he always was surrounded by those who wanted and loved him. Deja, on the other hand, had one dad who she never knew and one mom who abandoned her. Not exactly an apples to apples comparison, right? Deja has a choice to make — she can decide to close herself off to the Pearsons and isolate herself in her own story, or she can choose to take back some agency. See, Deja has lost almost all of her agency. Her mother never allowed her to meet her father, and Deja was stripped of her familial identity. She’s been shuffled around and is not even sure who she is. That internal struggle manifested itself externally last season. Now, Deja decides that the cost (the pain) is worth it in order to gain the closure: So she visits her biological father. And she has a conversation with him that allows her to finally place her past firmly in the past. Randall, for all his well-intentioned monologues, would have never been able to give that to Deja — she had to choose it for herself, and it was something even he’d never be able to truly understand. The cost of something of her own — a choice she made in her story instead of one being made for her — is what spurs Deja to confront her father, and then allow Beth and Randall to sign the adoption papers. Deja’s choice came with a cost, but it was worth it in order to feel a sense of agency in her life. Let’s talk about the most awkward date in history. Jack literally has $9 to spend on his first date with Rebecca, and it’s a disaster from start to finish. It didn’t begin that way: remember that Jack and Rebecca saw one another (him being drawn to her singing) and they had some sort of magical connection. But when Jack realizes how little he has in order to take out this beautiful woman, he’s already insecure. Starting from a place of insecurity on a first date is not a great place to start. Nevertheless, Jack takes Rebecca to a carnival. Between the tickets and food, Jack is awkwardly trying to spend as little money as possible. The cost here is obvious — physical money. But the cost of prioritizing insecurity over connection and honesty? That cost Jack a few hours of uncomfortable conversations (where Rebecca brings up Vietnam, and the pair realizes they love none of the same things). Rebecca is not feeling the date either, but finally at the end of the night, Jack decides to be honest. That honesty is what actually causes Rebecca to connect with him and see his true self. He admits to her that there are things in his past that are difficult to talk about, but that there’s something about Rebecca that makes him want to open up. It’s a really sweet moment, made sweeter by realizing that Jack’s decision to allow emotional connection in spite of his trauma is his “count the cost” moment — had he chosen to stay closed off, Rebecca and he might not have ever ended up together. Because he sacrificed the little bit of money he had and his emotional comfort zone, he gained the great love of his life. Toby and Kate are facing fertility issues when we pick up their story in “Nine Bucks.” And unfortunately, the more time that passes without a baby, the more despondent Kate grows. She’s up against PCOS, which makes it often difficult to conceive naturally, and her weight issues as well as Toby’s own reproductive struggles. When they meet with a doctor to discuss IVF, the response is… well, kind of terrible. For any doctor, really. The doctor essentially tells them that there’s no real chance of them conceiving, and she wouldn’t ever take that risk in order to accept them as patients. It’s incredibly harsh and Kate leaves in tears. Then she shows up at her birthday party and more awkwardness ensues when Kate reveals all of the drama and disappointment she’s faced in her quest to have a baby. I’m going to be honest: I struggle the most with Kate and Toby as characters. Heck, even Kevin was easier for me to connect with this episode (and he’s been a character who’s been difficult to love). Kate’s entire story has been about her weight — and all of her successes and failures seem to be weight-related (meeting and falling in love with Toby, her relationships with both Jack and Rebecca, her desire for a baby/inability to have one, etc.). While I understand that this will be a significant plot point in Kate’s past and present, I don’t even feel like I really know Kate and we’re three seasons into the show. So when the writers ask me to empathize with Kate at her birthday party, I struggle. The same is true for Toby: I’ve never really liked him as a character. At the beginning, he was obnoxious and abrasive. His inability to give empathy when it was necessary was troublesome. And the writers chose to redeem him the easy way — by pairing him together with likable characters (like the bachelor party episode) to make him more palatable. But Toby’s depression has yet to be explored, and we know it’s a significant hurdle in his life. So when Toby decides — without telling Kate — that he’s “counting his cost” and decides that Kate having a baby is more important than his mental health, I know we’re in for drama and struggle. For one thing, does anyone else feel like Toby doesn’t want a baby as much as Kate does? Kate’s whole world is centered on the quest for this baby. But I still don’t know WHY. Do you? I wish I had more insight into Kate as a character to know if she wants a baby so she can pour love and attention into someone else (in hopes it’ll help her become a better version of herself), or if she genuinely has always wanted to be a mom. As it stands, I think Kate will know pretty soon that Toby is doing whatever it takes to please her — regardless of whether or not it’s in his own best interest. Counting costs doesn’t mean things are bad, or even wrong. It’s important to get a realistic picture of what you’ll have to sacrifice in order to gain the thing you want. Right now, the Pearsons — past and present — are sacrificing to gain what they think will satisfy and sustain them. As their stories continue to unfold, we’ll see the consequences (good and bad) of their decisions. Zoe and Kevin are dating and have been since the season two finale and it’s ADORABLE. Interestingly, when Beth discovers what’s happening, she tells Kevin that Zoe will break his heart — not the other way around. I guess we’ll have to see whether or not that happens. I’m rooting for those adorable kids. Who’s the guy who showed up at Rebecca’s door?! And why is he waltzing up and just kissing her like that? Stay tuned for next week’s drama (and probably tears too)!